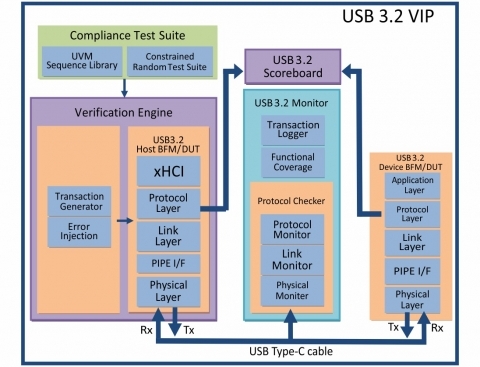 interfacing with USB 3.2 interface of an IP or SoC. SuperSpeedPlus USB specifications from USB-IF. Specification with backward compatibility to USB 2.0 . Supports enhanced Retimer block with layered monitors. Supports upto 128 devices including hub and device on any tier level. Supports all transfer types; Control, Bulk, Bulk Stream, Interrupt with flow control and retry mechanism. Support for pipelined isochronous and Smart Isochronous transfer. SuperSpeedPlus supports Simultaneous in Transactions with transaction re-ordering. Supports bursting in all transfer modes (Upto max burst size). SuperSpeedPlus supports Precision Time Measurement(PTM) and LDM protocol. Enhanced traffic and flow control management in link layer. Type 1 And Type 2 traffic Classes. Different Header packet framing for Deferred and Non- Deferred DPH. Supports all compliance pattern for compliance LTSSM state. Support TS1, TS2, TSEQ, SKP Ordered set generation. Support for all power management states (U1, U2, U3). Provides SSC and ppm support. Configurability to enable required data rate. 128/132 or 8b/10b encoding as per data rate selection. Call backs support in all Layers to provide user control and error injection.